Sadly Joe Tanevski, who our suppliers and customers will know and remember fondly (having been with us since 1975), passed away last Saturday 26 November. Both of our branches will be closed this Thursday, 1 December 2016 so we can bid him farewell and pay our respects. We will reopen on Friday 2 December. Carasel Towbars Pty Ltd has been operating for 48 years and is 100% Australian owned. We manufacture high quality, guaranteed towbars. 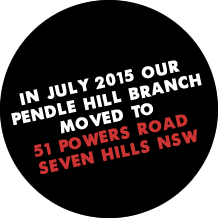 We distribute towbars Australia wide or fit to your vehicle while-u-wait at Seven Hills or Moorebank, 6 days a week. We stock towbar and trailer parts and accessories for DIY repairers. Altermatively we can do trailer repairs for you, or you can purchase a new trailer from stock, or by custom order. Need a new trailer? Contact us for a free quote.